For Fun, Who's on First? 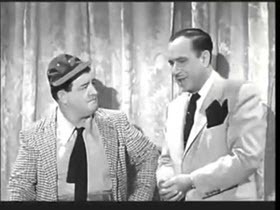 Abbott and Costello's "Who's on First?" was named by Time Magazine in 1999 as the best comedy sketch of the 20th century. They began performing the skit in the 1930s and continued to refine it through the 1950s. It was included in a couple of movies, radio shows, and TV shows. It was performed numerous times for President Franklin Roosevelt. In 1956 a gold record of "who's on first?" was placed in the Baseball Hall of Fame!